Catalina does provide a pretty decent tuning guide in the owner’s manual. But a lot of the specifics in that tuning guide are more qualitative then quantitative. So it’s difficult to judge if you have tuned the rigging correctly. I mean how do you really judge “a 50 pound push should deflect the upper shroud about 1″ at shoulder height”? 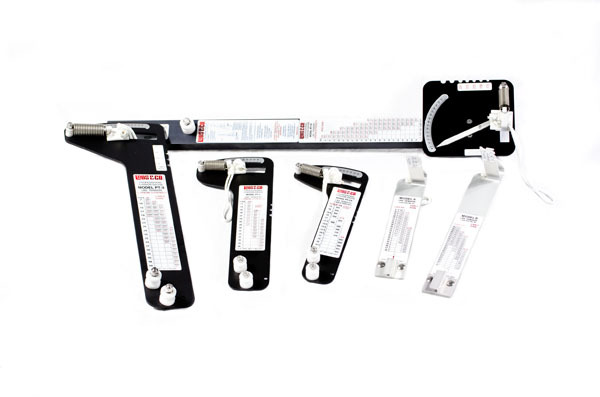 Loos & Co. Inc. does make tension gauges that give you some quantifiable numbers relative to your rig tension. And we have the PT-3 Tension Gauge (a tool, of course I have it). But the answer isn’t to simply put every wire to 15-20% of its breaking strength. To tune the rig correctly you need to account for rake (the distance aft of the mast base that the top of the mast will bend), prebend (the bow in the middle of the mast) and performance under load. Add to that the complication that the boat wasn’t constructed with all of the shrouds precisely located an equal distance from the mast base and that split backstays need to tensioned differently than a single back stay. This can get more complicated then simply turning turnbuckles until you get to a number. These brass turnbuckles with a built in cover that Catalina used on our C310 are horrible. There is not flat spot to grab these with a wrench, so you have to resort to putting a large screwdriver into the slot and using that to turn. When you actually start to really torque down on them the soft metal bends and you can’t really tension them well. I will eventually switch these out for standard, open body stainless steel turnbuckles. 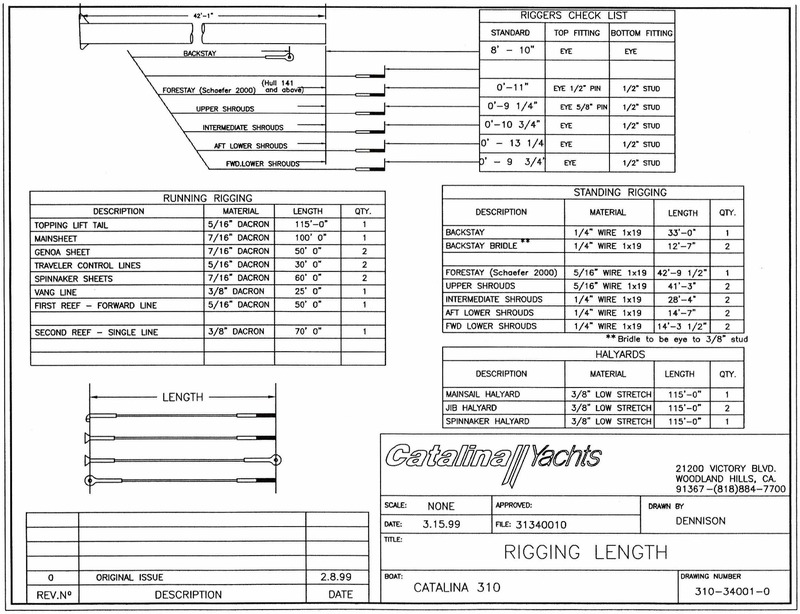 Here are some resources that I used to put together a rig tuning plan: Selden Masts Hints & Advice (large pdf); Practical Sailor’s Article Boat Clinic: Tuning the Masthead Rig; the C34 IA Techwiki on Rig Tuning; and the C34 IA Rig Tuning Chart. From what I have been able to gather from Catalina, riggers and other mast manufacturers when you setup a deck stepped, masthead rigged mast with perpendicular spreaders for cruising you want the mast centered between starboard and port, a 4-6 inch rake and a 0.5-1 inch prebend. 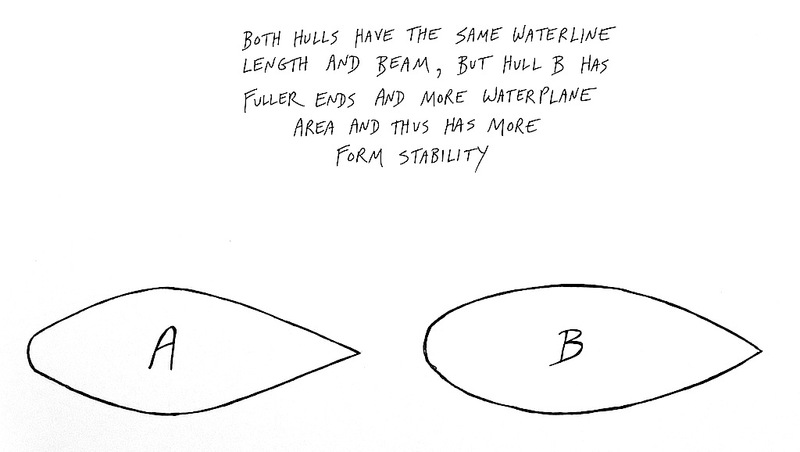 The forestay should be set at approximately 15-20% of the breaking strength of the wire. This is impossible to measure directly because of the roller furler. You have to measure this indirectly by the tension on the backstays. This is where it really gets a little complicated. The angle from the bow to the front of the mast is larger than the angle from back of the mast to the stern. This means the back stays will have more power in their pull than the forestay. The forestay is 5/16″ wire and has a breaking strength of 12,500 pounds. So 15-20% of this would be 1,875-2,500 pounds. Based on the angle difference I estimated that the backstays are 20% more efficient than the forestay (this is a bit of a SWAG). So that would mean that I would be looking for a tension setting of 1,500-2,000 pounds on the backstays. The backstays consist of a single 1/4″ wire from the masthead to approximately 12 feet from the stern. 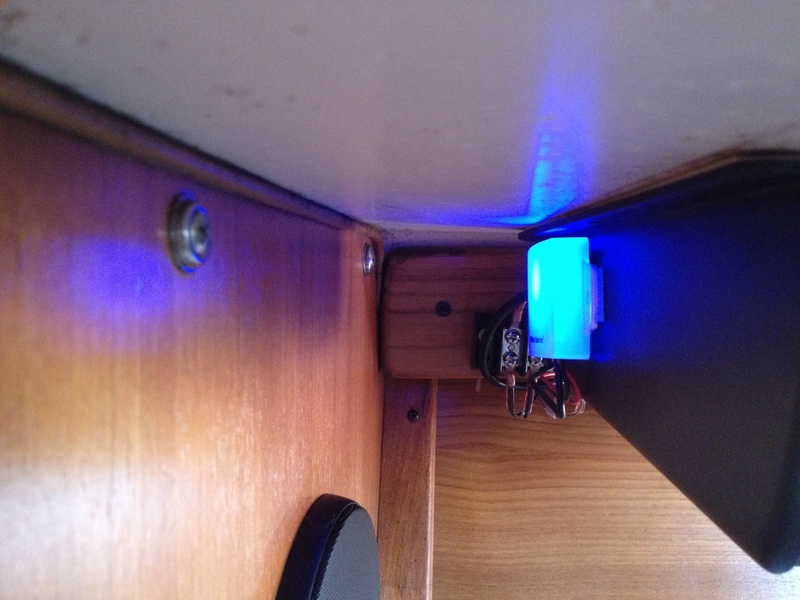 At 12 feet from the stern the backstay is split into two 1/4″ wires at a stainless steel plate. A 1/4″ wire has a breaking strength of 8,200 pounds; the tension setting of 1,500-2,000 pounds would be 18 to 24 % of the breaking strength of the wire. Based on this, I set my goal tension at 1,500 pounds or 18% of the breaking strength of the wire. As I said, the backstay splits at 12 feet from the stern. This point is too high for me to measure above the split. So I have to take my readings below the split on each leg. But that means accounting for the tension of both legs. The angle of the split is approximately 25 degrees. If the angle was at 45 degrees then each leg would just need to be set at 50% of the desired tension. Using another SWAG, I estimated that each leg needs to be set at 60% of the desired tension. That would be 900 pounds. The upper shrouds are 5/16″ wire. Based on my research I wanted these to be set at 15% of the breaking strength. The intermediate shrouds are 1/4″ wire and should be set at the 10% of breaking strength. The lower shrouds set the prebend and are 1/4″ wire. Since you want a 0.5-1 inch prebend you will have more tension on the forward lower shrouds then the aft lower shrouds. Neither should be more than 15% or less than 8% of the breaking strength. 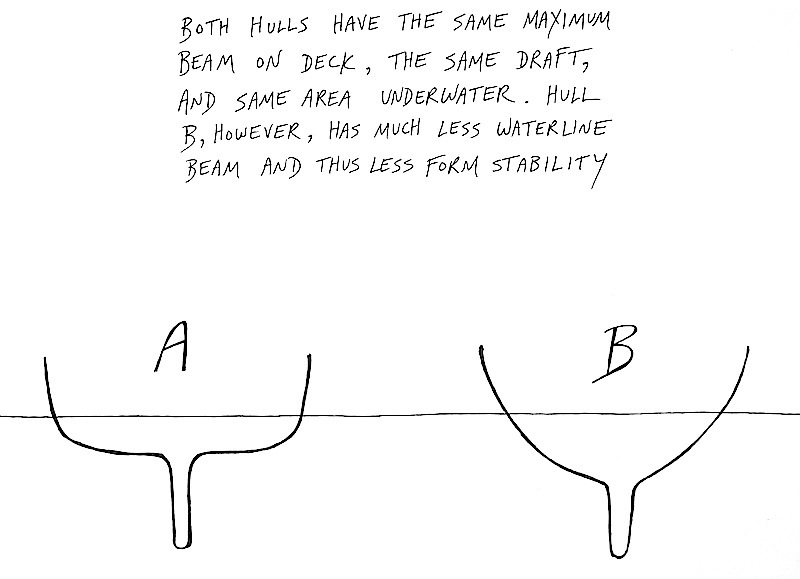 In an ideal world these tensions would be equal on the port and starboard sides of the boat but that would not likely be the case since the boat isn’t laid out exactly symmetrical. First thing I did was loosen all of the shrouds and backstays to hand tight. I measured to two points on the toe rail that was the same distance from the mast base. I then used the main halyard to measure if the mast was straight. 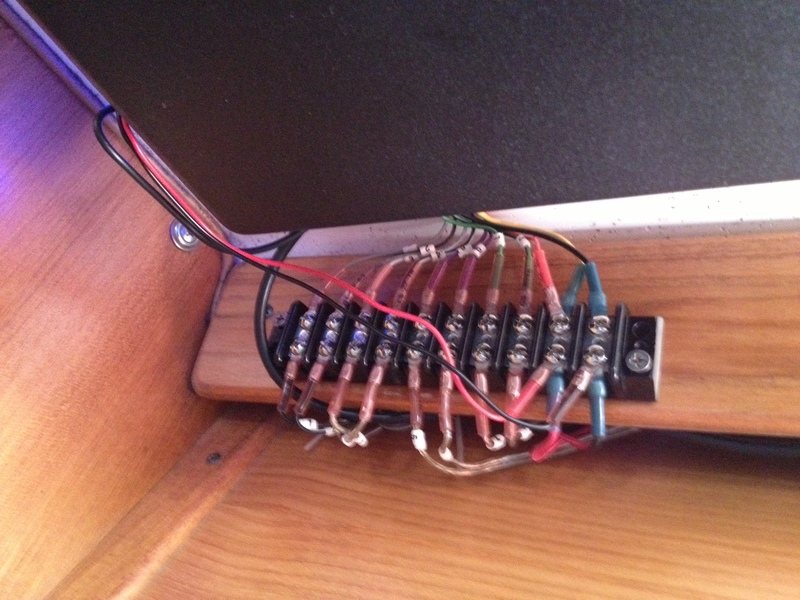 It wasn’t so I straightened the mast by adjust the upper and intermediate shrouds. I sighted up the mast to make sure it looked correct. Then I tensioned the backstays until I got to the desired rake. But guess what? The turnbuckles bottomed out and I could only get about 3-4 inches of rake. I measured the rake using the main halyard with some weight hanging from it (I used a water bottle). The backstay is too long. The easiest way to fix this is to cut about 6 inches off of the backstay above the split and use a Sta-Lok Eye Fitting to terminate the wire. But that will have to weight for another day. I was able to get to 3-4 inches of rake and an 8.5 on the Loos gauge (around 800 pounds). While not being perfect it would work. Next I tensioned the forward lower shrouds. At 12 on the Loos gauge I had about 1/2 inch of prebend. I measure the prebend by attaching the main halyard to the goose neck for the boom and putting tension on it. I then made a visual estimate of the bow towards the bow at the point where the forward lower shrouds attached. I then took up the aft lower shrouds until they read 7 on the Loos gauge. I then alternated port and starboard side, making a couple of turns on both the upper shrouds and the intermediate shrouds. I kept checking that the mast was straight with the main halyard. Eventually I got to a point where I couldn’t tension the upper shrouds any more. The brass turnbuckles were just warping under the pressure and I didn’t feel comfortable. Both the port and the starboard were reading 25 on the Loos gauge. But when I sighted up the mast and measure it with the main halyard it appeared that there was a slight bend to port. So I loosened the port a half turn at a time until it was straight. The next step in tuning is to see how it performs under sail. I simulated this at the dock. When sailing in 10-15 knots of wind we are healing between 10-15 degrees. So I attached the main halyard to a cleat at the dock and cranked it in until we were healing 10 degrees. I then went and checked the “leeward” side. Only the intermediate shrouds felt loose. So I took up two full turns on it. I repeated the process on the other side and got the same result. I pinned the turnbuckles and I am ready to sail. The whole rig feels a lot tighter and more secure than it did prior to the tuning. I had one of my sailing buddies that races a lot and has been crew on many delivers over and he took a look. He was amazed at how straight I got the mast port to starboard. 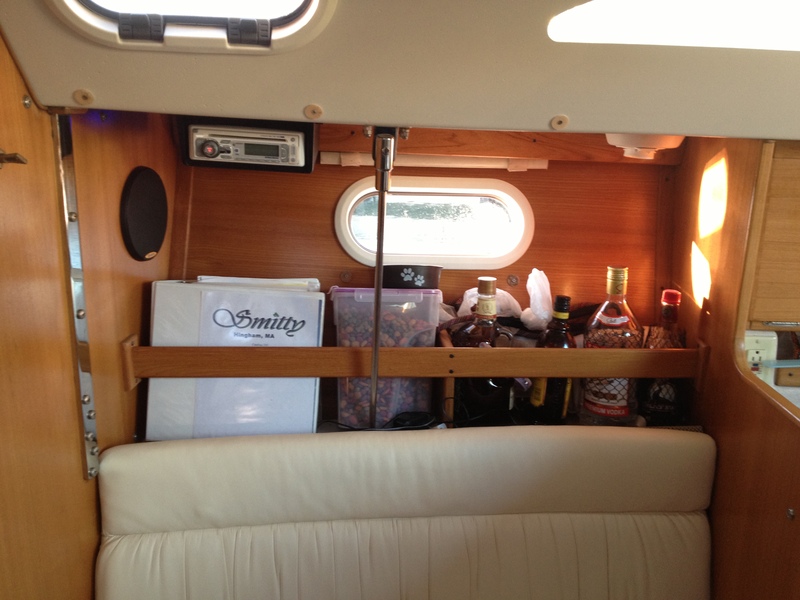 He said he would feel very comfortable sailing on our boat offshore. Categories: Sails & Rigging, Upgrades & Repairs | Permalink. So I tried to farm this research and work out to an expert rigger, but after going back and forth with him for over 4 months and still not having anything to show for it I gave up. I fired him a few weeks back and started doing my own research. All of the running rigging with the exception of the furling line on Smitty is original. That makes it 14 years old and it is showing it’s age. There are numerous locations with noticeable dry rot and some chafing. Most of the white line now looks gray with the exception of the areas that are either always in the mast or in the organization bags in the cockpit. We also will get a little bit of bagging in the base of the sail. I had a sailmaker look over the sail last year and they said it was in near new shape (not a surprise, the previous owner only sailed the boat a couple of times a season and the sail still had creases when we bought the boat). Thier recommendation was that the halyard had too much stretch and that we should add a cunningham. One of the good things about owning a Catalina is that they have very good owners manuals. For the C310 they have a page in the manual that gives you all of the diameters and lengths of line you need for the running rigging. So with that in mind I started looking at different types of lines. I started with Catalina Direct. They had various halyards and sheets for sale. 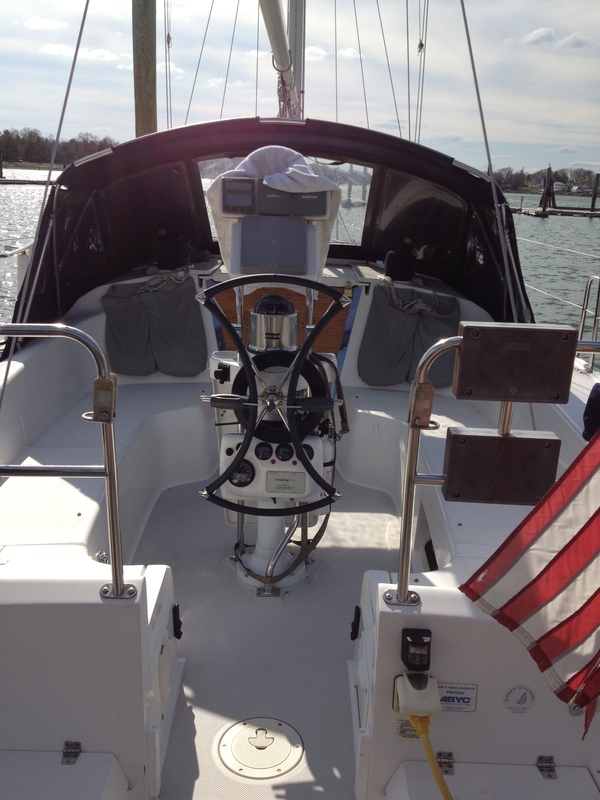 For the halyards they use a 3/8″ Dyneema core line with a polyester cover that is supposed to provide an extremely low stretch halyard for about $1.85 per foot. For sheets they use a 7/16″ polyester core with a dacron polyester cover that is supposed to provide a low stretch sheet for about $1.00 per foot. After doing a little research I decided that the lines offered by Catalina Direct were good for day sailing with the occasional coastal cruising but that we should upgrade to something better for Caribbean cruise. I next looked at Samson Ropes, they are sold by Defender and our friends Pam & Chris have used these lines on their Catalina 30. The Sampson XLS Extra is a Dyneema core line with a polyester cover; in 3/8″ line it has a breaking strength of 5,100 pounds and an elastic elongation of 0.8% at 20% load at a cost of $1.39 per foot. This would be a good upgrade for the halyards. The Sampson XLS is a polyester core line with a polyester cover; in 7/16″ line it has a breaking strength of 5,800 pounds and an elastic elongation of 2.2% at 20% load at a cost of $0.99 per foot. I also looked at New England Ropes, they are sold by West Marine, Defender and a couple of other local companies. They were recommended by the rigger I tried to higher to do this work. The New England Ropes Sta-Set X is a polyester core line with a polyester cover. However they use a patented parallel fiber core that is supposed to provide superior strength and lower stretch than Dyneema. In 3/8″ line it has a breaking strength of 5,300 pounds and an elastic elongation of 0.7% at 20% load at a cost of $1.65 per foot at West Marine. Again, this would be a good upgrade for the halyards. The New England Ropes Sta-Set is a polyester core line with a polyester cover; in 7/16″ line it has a breaking strength of 7,100 pounds and an elastic elongation of 2% at 20% load at a cost of $1.80 per foot at West Marine. After weighing these options and reading some reviews on the typical boating forums, I decided to go with New England Ropes. I was able to get the lines much cheaper than West Marine from a shop called Rigging Only located down in Fairhaven, Massachusetts. I ended up paying $0.88 per foot for the 3/8″ Sta-Set X and $1.08 per foot for the 7/16″ Sta-Set. The next thing we had to figure out was how to connect the line to the shackles. A common approach is to splice an eye in the end of the line. This gives you close to 100% of the strength of the line. But one downside is that splices can make the line thicker for about 6 inches at the splice. This can get jammed in the sheaves at the masthead. Another issue is that is more difficult to periodically end-for-end the line to prolong the life of the line. The buntline hitch: new knot for us to learn, reduces the line strength by 25-50%, can be tied in about a 2″ length on the size lines for the halyards; cannot easily be untied; pulls straight on the headboard. We decided to go with the tying a buntline hitch onto the shackles. This knot is relatively easy, can be tied close to the shackles and doesn’t reduce the strength of the line too bad. We might have to cut the knot off when we go end-for-end but that’s not a big deal since we would want to get rid of that portion of the line anyways. To learn the knot I went to Animated Knots by Grog. After a couple of test knots I was good to go. To run the new halyards I put them end-to-end with the old line. I then used some waxed polyester whipping twine and a sailmaker’s needle to connect the two lines. You don’t have to do much, just 4-6 loops through both lines will keep them together without adding much thickness so they can pull through the sheaves easily. It took me about an hour to replace the 4 halyards on the boat. Let’s talk about the 4 halyards for a minute. Smitty has those nice, fancy labels on all of her clutches that label the lines. 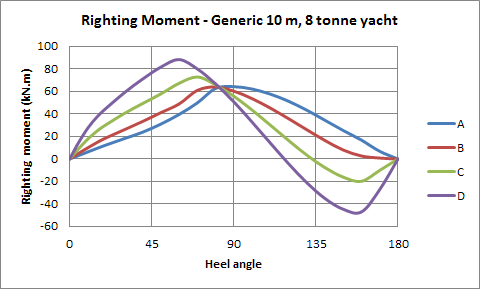 According to those we have a boom topping lift, a main halyard, a jib halyard and a spinnaker halyard. The boom topping lift and the main halyard run up to the two sheaves on the stern side of the mast and the jib and spinnaker halyards run up to the two sheaves on the bow side of the mast. Technically the “spinnaker” halyard is just another jib halyard as spinnaker halyards on masthead sloops would go through a block that is outside of the mast to allow for the proper angle of approach from a spinnaker. But we don’t have any plans to fly a spinnaker and the primary purpose of this line will be to lift the dingy so it’s not a big deal for us. Also, we don’t technically need a topping lift. We have a rigid boom vang that supports the mast without the topping lift. The primary purpose of the topping lift on our boat is to hold the Dutchman system for the mainsail. An upgrade suggested by the rigger before I fired him was to replace the small diameter topping lift with the same line as the main halyard. This would give us a backup halyard incase anything happened with the primary main halyard. Once all of the halyards were replaced, we bent on the sails. Smitty finally looks like a sailboat again! We still have some of the other running rigging to replace. Also, I want to give the mast a good tuning before our trip to Provincetown for July 4th. But it’s nice to be a sailboat again.